Fred Shapiro and Michelle Pearse have just published in the Michigan Law Review “The Most-Cited Law Review Articles of All Time.” It is a fascinating read, and includes some choice nuggets about international law scholarship. 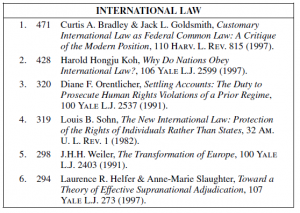 Among the more interesting findings is that of the recent era (1990-2009) only three international law scholars were among the most-cited: Curtis Bradley, Jack Goldsmith, and Harold Koh. In the recent era only six law professors (Mark Lemley, Cass Sunstein, Akhil Reed Amar, William Eskridge, Robert Post, and Reva Siegel) have had more citations and only seven other law professors (Stephen Bainbridge, Lucian Arye Bebchuk, Yochai Benkler, John Coffee, Dan Kahan, Lawrence Lessig, and Benjamin Spencer) have had as many top citations as the three IL citation superstars. See p. 1506. (I’m happy to say that one of Koh’s two-most cited articles was in an AJIL Agora debate in which I participated, albeit on the opposite side of the question). 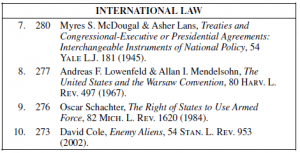 The other interesting nugget from the Shapiro and Pearse article is the list of the most-cited international law articles of all time, which I reproduce below. Kudos to Bradley, Cole, Goldsmith, Helfer, Koh, Lans, Lowenfeld, McDougal, Mendelsohn, Orentlicher, Schachter, Slaughter, Sohn, and Weiler for making the list! Response.. Intersting, and then there are Brian Leiter’s two more recent studies — not with respect to frequency of citations to particular articles but to particular professors. Yes there is a meditation there. Four of the 10 appear to be more inward looking U.S. Foreign Relations Law (B and G, M and L, L and M, and C) rather than International Law. I think Ben Davis makes an important point that I was thinking about making as well. So much of what people talk about as “international law” in this country is really better characterized as primarily US constitutional or foreign affairs law, in that it is primarily about US law and/or politics, and the international legal sources considered are not the primary focus of analysis. 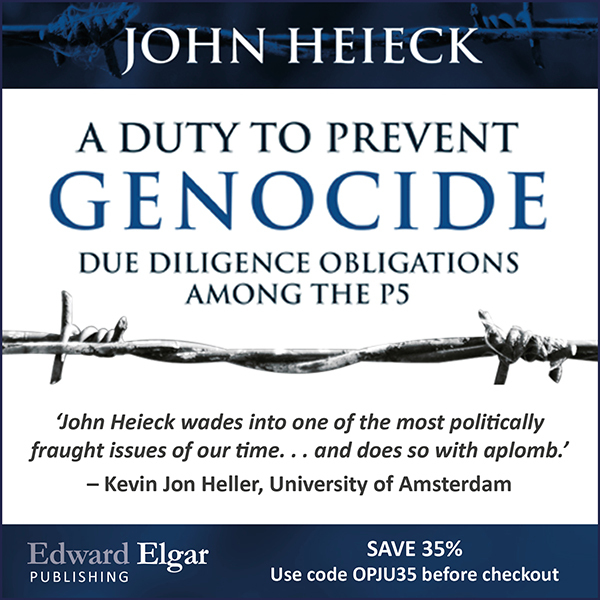 I find that there are actually relatively few academic international law scholars in this country whose work is primarily on issues of pure international law. I think this very much distinguishes IL scholarship in this country from scholarship in the UK and Europe, which tends to be much more focused on pure international law subjects. How many quotations of foreign practice there are in this very good literature? How many citations of doctrine written in French, Spanish, German or Italian? 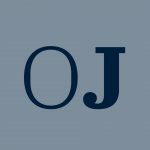 How many references to judiciaal decisions outside the US?